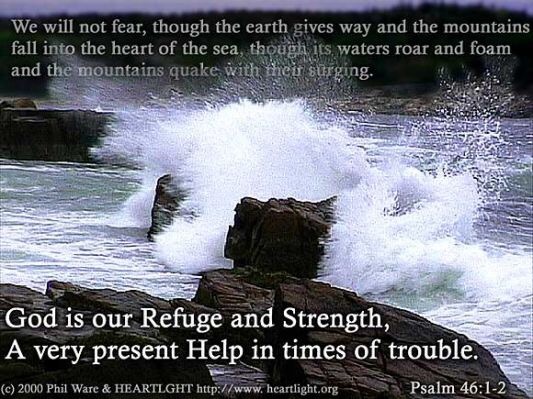 1God [is] our refuge and strength, a very present help in trouble. 2Therefore will not we fear, though the earth be removed, and though the mountains be carried into the midst of the sea; 3[Though] the waters thereof roar [and] be troubled, [though] the mountains shake with the swelling thereof. Selah. 4[There is] a river, the streams whereof shall make glad the city of God, the holy [place] of the tabernacles of the most High. As believers in Christ we are God’s dwelling place through him. Jesus Christ prayed for God to send each one who believes in him the Holy Spirit and this is why believers have the indwelling Holy Spirit that comforts, guides and testifies of Jesus Christ, reminding us of Jesus’ teachings as well as reveals, teaches and counsels the mind and will of God. Worshippers of God who is Spirit that worship Him “in spirit and in truth” are true worshippers (John 4:23-24) or true believers in Jesus Christ. They acknowledge the importance of the Holy Spirit as God Himself on one hand and the power or anointing of God on the other. The Holy Spirit indwelling believers in Jesus Christ since the Day of Pentecost (Acts 2:1) is therefore an affirmation that God Himself is indwelling those who accept to be His City or Holy place/tabernacle when they accept Jesus Christ as LORD and Saviour. They welcome the presence of God in their lives by virtue of being obedient followers of Jesus Christ. The key word is obedience. God who is in the midst of the lives of His children (Psalm 46:4) is our “refuge and strength, a very present help in trouble”. Whatever troubles that exist or come our way will not cause us to fear (Psalm 46:1-3). Our God is a “man of war”; his nature as a warrior is expressed in His names: Jehovah Gibbor (The LORD is Mighty: a Mighty Man of War), Jehovah Nissi (The LORD my Banner, Standard or Standard Bearer), Jehovah Sabaoth (The LORD of hosts or the Armies of Heaven, Jehovah Sabaoth). Even when He commands us to do something or to depart from sin, God does not send us on our own. 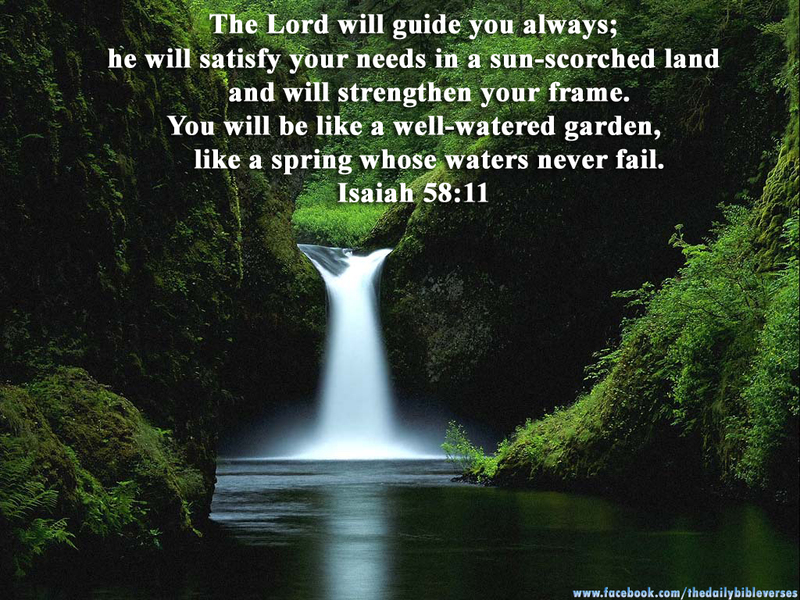 As our strength and refuge He goes ahead of us and is also our rear guard (Isaiah 52:10-12). Being a very present help in times of trouble reveals who He is; a God of everlasting love and faithfulness. “3The LORD hath appeared of old unto me, [saying], Yea, I have loved thee with an everlasting love: therefore with lovingkindness have I drawn thee.” (Jer. 31:3 KJV). “There is a river, the streams whereof shall make glad the city of God, the holy [place] of the tabernacles of the most High.”(Psalm 46:4 KJV). Applying verse 4 prophetically we can state what is true, that believers in Christ are God’s Holy City, individually and collectively. Our calling is therefore to daily reflect in the here and now, through holy living in Christlikeness, the Holy City of God, the New Jerusalem that will at the end of the age (Rev. 21:2) come “down out of heaven from God, prepared as a bride adorned for her husband”. Regardless of professing to be a Christian, without living a life of holiness as God commanded believers in Christ to live (1 Peter 1:15-16/Lev. 11:44-45) one cannot be a dweller in the “tabernacle of God” (Rev 21:3) that is to come among God’s people. The river of Psalm 46:4 is likened to the Holy Spirit within the believer of Christ “Holy City of God”. As stated God is Spirit so we can see that the river also speaks of God Himself. God is in us, God is with us, Emmanuel. What does this river of God or God do? He who is within us, God’s holy place. God makes us glad. What does Glad mean? Happy, delighted and pleased. God is Spirit and permeates every area of the life of the believer in Christ who allows Him to. This way God reclaims every area of the life of His children that Satan has held bound. This is demonstrated by the indwelling Holy Spirit that raised Jesus from the dead imparting resurrection life in a Christian’s body so that they are activated and energised to constantly fulfil their predestined purpose on earth according to the will of God (Romans 8:11). Satan is a thief, the agent of oppression and depression, as we know there is no pleasure, delight or happiness in anything Satan has to offer us! In contrast Jesus came to liberate us from the oppression and depression of Satan and to make us glad or fill us with the joy of the LORD. He came to give us abundant life (John 10:10). Jesus Christ alone can quench the “thirst” of the thirsty. Who are they? those who are in need of salvation from a life lived for self or Satan that affirms they lack the living waters of God, the river of life. “In the last day, that great [day] of the feast, Jesus stood and cried, saying, If any man thirst, let him come unto me, and drink. He that believeth on me, as the scripture hath said, out of his belly shall flow rivers of living water. (John 7:37-38 KJV). When we have Christ in our lives, we have God with us and in us because God and Christ are one. Jesus said “I and the Father are one” (John 10:30). In God’s presence there is fullness of joy and pleasures forever more (Psalm 16:11). Yes our God and Christ in the power of the Holy Spirit make us glad. Let us be reminded daily that we are not saved to just sit in our laurels and do nothing. There are conditions that God requires in order for His works, protection and joy or gladness to be sustained and abundant in our lives. Continuous obedience to God’s commands sustains our ability to abide in God’s love as Jesus did. Jesus told the aforementioned to his disciples then, also a message for any one who is his disciple from Jesus’ time, because he knew that this was the only way they could have the sustained fullness of God given joy that is humanly possible. Obedience is indeed key. It results in God’s presence and love (John 15:10-11/John 14:21,23) being made manifest in our lives and produces a sustained exuberance of supernatural joy of the LORD! That is what the gladness of the river of God means in a nutshell! 2. PRIORITISING PRAYER & BEING PREPARED TO BE USED BY GOD IN HIS ANSWER TO BURDENS PRAYED. Another key condition is to prioritise prayer. Nehemiah who left Persia to became governor of Judah and led the rebuilding of Jerusalem’s walls and gates project prioritised prayer throughout his mission. The priority of prayer works wonders! Nehemiah’s successful mission is due to his fervent prayer life. When we study the book of Nehemiah, we realise that apart from praying on the onset having heard about the state of Jerusalem, he prayed regularly throughout the rebuilding project (e.g. chapter 1:5-11, 4:4-5, 5:19,6:9). What burden do you have as a Christian? Do you have a burden to pray for the unsaved, abused children or the poor? Whatever it is, God also requires you to seek to hear from Him about what part you can play in being part of the solution of what burdens your heart. After all that burden is God given and believers in Christ are mandated to be his hands and feet. Nehemiah did not only express his grief concerning the state of Jerusalem and desire for change by praying to God but he responded in the affirmative to the God given urge within him to return and lead the building project. Prioritising prayer results in us being close to Father God so that we are sensitive to his voice and prompting so as to make do His bidding and make wise decisions. Nehemiah gained and made use of God given wisdom and discernment. Following prayer to God, he was able to ask the King of Persia exactly what he would need on his journey back to Jerusalem (Nehemiah 2:4-8). He also knew when his enemies were planning to lie against him and also when they were planning to kill him (Neh. 6:5-12). As a result he was able to prevent himself from being trapped or cornered, avoiding death and therefore the thwarting of the plan of God through him. God gave him strategies so that he and the builders were protected from their enemies (Neh. 4:16-23). Nehemiah by prioritising prayer had intimacy with God and this is why he was a highly effective leader in many ways. As we can see God was Nehemiah’s “refuge and strength, a very present help in trouble” (Ps. 46:1-3 KJV). “…Go your way, eat the fat, and drink the sweet, and send portions unto them for whom nothing is prepared: for [this] day [is] holy unto our Lord: neither be ye sorry; for the joy of the LORD is your strength.” (Neh. 8:10 KJV). PRAYER BURDENS VERSES PREDESTINED CALL OF GOD. Every believer in Christ has one or more predestined mandates to accomplish in their lifetime on earth. The burdens God gives you to pray about are very rarely apart from your fundamental predestined call of God. They more often than not affirm that you are indeed called for that particular purpose which will present itself in different ways. After all as a believer in Jesus Christ you are mandated to do his works and even greater works than he did on earth (John 14:12) by the enabling of the Holy Spirit “The river of God”. We, God’s children are His workmanship with many promises, personal and ministerial which when we partner with Him without constraint we will see come to pass in our lives. Below are key scriptures to receive as prophetic promises in our hearts for meditation and encouragement as we fulfil our God given mandate on earth. 3To appoint unto them that mourn in Zion, to give unto them beauty for ashes, the oil of joy for mourning, the garment of praise for the spirit of heaviness; that they might be called trees of righteousness, the planting of the LORD, that he might be glorified. 4And they shall build the old wastes, they shall raise up the former desolations, and they shall repair the waste cities, the desolations of many generations.5And strangers shall stand and feed your flocks, and the sons of the alien [shall be] your plowmen and your vinedressers. 6But ye shall be named the Priests of the LORD: [men] shall call you the Ministers of our God: ye shall eat the riches of the Gentiles, and in their glory shall ye boast yourselves.7For your shame [ye shall have] double; and [for] confusion they shall rejoice in their portion: therefore in their land they shall possess the double: everlasting joy shall be unto them. (KJV).